Students perform less well in end-of-term exams if they are allowed access to an electronic device, such as a phone or tablet, for non-academic purposes in lectures, a new study in Educational Psychology finds. Students who don't use such devices themselves but attend lectures where their use is permitted also do worse, suggesting that phone/tablet use damages the group learning environment. 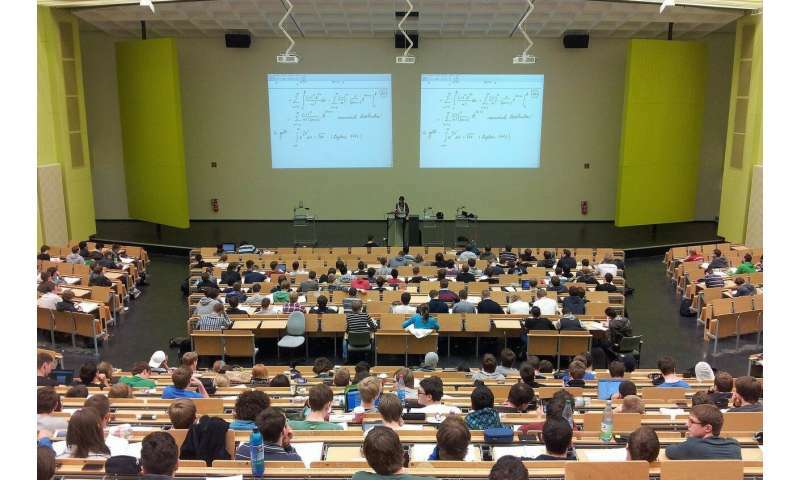 Researchers from Rutgers University in the US performed an in-class experiment to test whether dividing attention between electronic devices and the lecturer during the class affected students' performance in within-lecture tests and an end-of-term exam. 118 cognitive psychology students at Rutgers University participated in the experiment during one term of their course. Laptops, phones and tablets were banned in half of the lectures and permitted in the other half. When devices were allowed, students were asked to record whether they had used them for non-academic purposes during the lecture. The study found that having a device didn't lower students' scores in comprehension tests within lectures, but it did lower scores in the end-of-term exam by at least 5%, or half a grade. This finding shows for the first time that the main effect of divided attention in the classroom is on long-term retention, with fewer targets of a study task later remembered. In addition, when the use of electronic devices was allowed in class, performance was also poorer for students who did not use devices as well as for those who did. The study's lead author, Professor Arnold Glass, added: "These findings should alert the many dedicated students and instructors that dividing attention is having an insidious effect that is impairing their exam performance and final grade. "To help manage the use of devices in the classroom, teachers should explain to students the damaging effect of distractions on retention—not only for themselves, but for the whole class." This is the first-ever study in an actual classroom showing a causal relationship between distraction from an electronic device and subsequent exam performance. Does good attendance equal good grades? Actually, most reputable learning institutions forbid phones and or other personal electronic devices in the exam room, many already exclude them in the lecture halls - and or collect them at the door at the students own risk. These are well known policies and students have no excuse to have their phones with them during an exam. What good are lectures when I can reread text, do side research, pause to check my phone, and zoom in on pics and other display material? And I can do this whenever I want rather than 8:00 on a rainy tues morning half way across campus?